Last week, the German newspaper ‘Süddeutsche Zeitung’ published an article about the ‘conning’ of Ireland – over several decades – by its political masters. Anyone who wants to understand why Ireland could be so rich yet will probably remain poor should learn about Ray Burke. is almost as well known as James Joyce, Samuel Beckett or the U2 singer Bono who, in his sunglasses, always looks like a pudgy fly. People in Ireland don’t have positive thoughts about Ray Burke. After all, he sold their future. The ruined Anglo Irish Bank has just made headlines posthumously after the Irish Independent published transcripts of telephone calls from September 2008. On the tapes you can hear how high-ranking bankers make fun of the crisis. The €7 billion emergency assistance that they demanded from the government would be paid back when they have the money, the bankers agree jokingly – “in other words: never”. That money won’t be enough anyway, says one department head, as he pulled the €7 billion figure “out of my arse”. 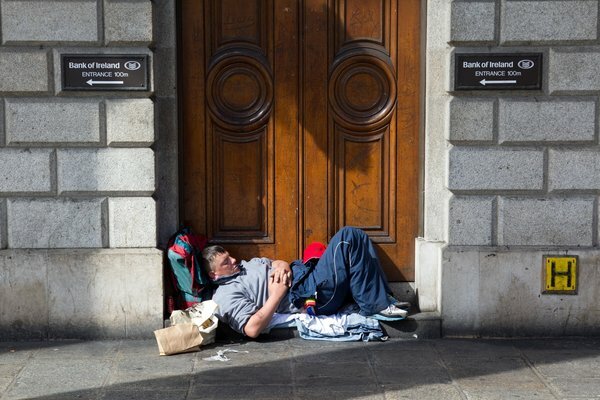 In a now legendary all-night sitting on September 29th, 2008 the Irish government agreed to guarantee all bank debts. O’Toole calls this the “most disastrous decision that was ever made by an Irish government”. At least two generations of taxpayers will pay off these debts. O’Toole makes an excellent job of charting the Irish path to disaster in his book Ship of Fools, in which he calls the accounts of Anglo Irish Bank the “most inventive work of Irish fiction since Ulysses”. hadn’t made an already bad deal for the Irish people even worse……………………………. A HIGH Court judge has cleared the way for aggrieved customers to initiate private criminal prosecutions against bank staff. In a landmark judgement, Mr Justice Gerard Hogan upheld the right of citizens to bring private prosecutions, after lawyers for Irish Bank Resolution Corporation (IBRC) claimed this right had been abolished 14 years ago. His decision paves the way for a hotelier to bring a private prosecution against two IBRC officials he claims behaved dishonestly during discussions about a rescue plan for his business, which has debts of €23m. It is believed to be the first case of its kind since the banking collapse and could lead to a raft of similar actions. “Employees of financial institutions never thought that they could be prosecuted for their actions as bank officials,” one senior counsel told the Sunday Independent. A summons has been issued to compel the bank officials to attend to answer allegations in a district court. Once that hearing takes place, it will then be up to the Director of Public Prosecutions to decide whether the case should proceed further. “The underlying purpose of the private prosecution is . . . to draw the public prosecutor’s attention to the case with the implicit request that the prosecution be taken over (by the DPP),” Mr Justice Hogan said in his written judgement. The ruling opens the way for disgruntled customers to take cases against officials at all levels of the banking sector. However, legal experts warned there are dangers involved for people seeking private prosecutions, as they could find themselves liable for substantial legal costs if they fail. The ruling came after one current and one former member of IBRC staff sought a judicial review to bring a halt to hotelier Pat Halpin’s private prosecution against them. Mr Halpin, 62, has run hotels in Dublin and his native Clare for a quarter of a century, but got into difficulty in recent years over borrowings with the former Anglo Irish Bank. His businesses include the Aberdeen Lodge and Merrion Hall boutique hotels in Ballsbridge, Dublin, and Halpin’s Townhouse in Kilkee, Co Clare. IBRC last year appointed a receiver to two of his companies, Crossplan Investments Ltd and Elektron Holdings Ltd, which look after his interests in Dublin. He claims he was invited to a meeting with two IBRC officials in February last year – before the receiver was appointed – to discuss the sale of Merrion Hall in a bid to pay down debt. Mr Halpin says he and his accountant were left with the impression from the meeting that the matter would be considered further “within the higher echelons” of the bank and that the bank would come back to them with proposals. However, Mr Halpin claims he later learned it had already been decided by IBRC that a receiver be appointed to both companies. He alleges a letter he subsequently received from the bank showed clearly that both officials had known that a receiver was to be installed at the time of the meeting and had deliberately concealed this knowledge from him. Mr Halpin subsequently initiated a private prosecution against the two officials in the district court – alleging offences of dishonesty under the Criminal Justice (Theft and Fraud Offences) Act 2001 – and succeeded in getting the court to issue a summons against both. The charges have been denied by the two officials. Both went to the High Court seeking to halt the private prosecution, claiming such prosecutions had been effectively abolished by the 1999 Criminal Justice Act. They contended that there had to be a preliminary examination procedure for a private prosecution to take place. The officials argued such prosecutions had been effectively abolished because the Act did away with the traditional practice of holding a preliminary investigation in the district court to determine if sufficient grounds existed for sending a person forward for trial to a higher court. In his ruling last week, Mr Justice Hogan disagreed and said the right to a private prosecution had not been indirectly affected by the abolition of the preliminary examination. The judge also said that, although he felt Mr Halpin’s case “seems slender and tenuous”, he would not be justified in quashing the summonses. Mr Justice Hogan cautioned it was also important to remember that the charges had been denied in the most emphatic terms by the two officials and they had yet to be heard on the merits of the complaints. The judge said he would leave it to the DPP to decide whether the case should proceed or be dismissed. He also awarded Mr Halpin 60 per cent of his costs. A stay has been placed on the private prosecution until January to allow the bank officials to appeal to the Supreme Court. As yet, there has been no indication such an appeal will be lodged. Law Library sources said the ruling was significant as it confirmed the rarely used right of people to bring private prosecutions. Any citizen with a reasonably credible complaint against somebody can walk into the district court and convince a judge to grant permission for a criminal summons, one senior legal expert said. The standard of proof for the issuing of a summons is low and those who were summonsed would, in all practical circumstances, have to challenge the allegations made against them in court, the source added. Mr Halpin told the Sunday Independent he was hopeful he would succeed in persuading the DPP to take up his case. The businessman is also taking a separate action against IBRC for alleged overcharging to the tune of €2.6m.